BULAWAYO, Zimbabwe, Apr 10 2017 (IPS) - Microscopic soil organisms could be an environmentally friendly way to control crop pests and diseases and even protect agriculture against the impacts of climate change, a leading researcher says. Africa is battling an outbreak of trans-boundary pests and diseases like the invasive South America fall armyworm (FAW), tomato leaf miner and the TR4 which have cost the agriculture sector millions of dollars in crop damage. “Research from our labs at Auburn University has shown a great potential in microbes for helping fight pests- and we have done some research on fall army worm that are pests in turf grass,” said Dr. Esther Ngumbi, a post-doctoral researcher in the Department of Entomology and Plant Pathology at the Auburn University in Alabama, United States. Researchers also say microbes can help preserve the environment threatened by growing reliance on chemical solutions in fighting crop and livestock trans-boundary pests and diseases. Pesticides pose a threat to food safety, human and ecological health, necessitating the promotion of non-chemical alternatives to handling pests. Researchers at Auburn University have worked on beneficial soil bacteria/microbes, specifically plant growth-promoting rhizobacteria (PGPR). The soil dwelling bacteria that colonize plant roots have beneficial effects of increasing plant growth and enhancing the ability of plants to fight off herbivorous insect pests such as the beet armyworm-Spodoptera exigua and the fall armyworm Spodoptera frugiperda to which they have a direct toxic effect. First reported in Sao Tome and Principe in January 2016, the crop-eating pest has affected thousands of hectares of crops in Namibia, Malawi, Mozambique, South Africa, Uganda, Zambia and Zimbabwe to date. The pest which is difficult to control with one type of pesticide can cause extensive crop damage of up to 73 percent in the field. It also attacks non-cereal crops including potato, groundnut, spinach, tomato, cabbage, soybeans, cotton and tobacco. In Brazil the fall armyworms have a cost of 600 million dollars a year to control. Dr. Christian Thierfelder, Senior Cropping Systems Agronomist at the International Maize and Wheat Improvement Center (CIMMYT), Southern Africa Regional Office, says poor identification of the pest delayed response to the outbreak in November 2016 because the pest has never been encountered before in Southern Africa. “Everyone was classifying it [FAW] as a stalk borer or the American bollworm but they were all wrong. This new pest has now been identified as the fall armyworm and people started extensively using pesticides – some of them not yet registered,” Thierfelder told IPS. The approach promotes the use of safer alternatives to pesticides like biocontrol and cultural practices. These include resistant cultivars to control insect pests and diseases, crop rotation and diversification at the plot and landscape, monitoring of insect pests using pheromone traps and seed treatment with beneficial soil rhizobacteria to reduce soil and foliar diseases. Thierfelder said during extensive field tours in southern Africa, he observed less damage in early planted maize fields under conservation agriculture, intercropped with pigeonpeas or cowpeas and with some trees nearby. 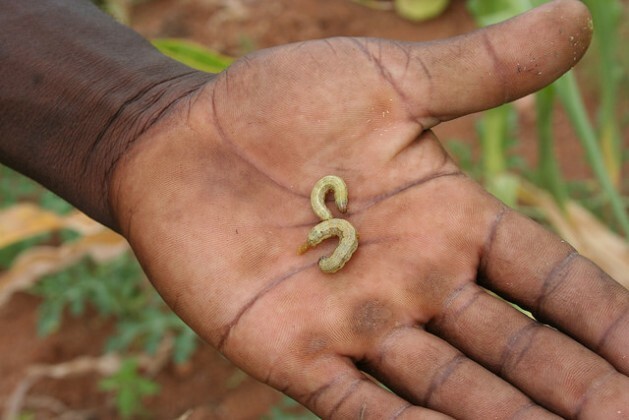 FAO Sub-regional Coordinator for southern Africa, David Phiri, says the fall army worm has threatened food security in the region because it is new and exposed the need to investment in surveillance systems. “We do not have ready-made control mechanisms for the fall armyworm and we worry that pesticides used indiscriminately might actually contribute to environmental damage and also contribute to pesticide resistance,” Phiri said. According to the 2017 FAO report “The future of food and agriculture: Trends and challenges,” public investment is required to catalyze and support private investment. Investment in R&D has to be associated with the development of infrastructure and services to prevent and control the spread of pests and diseases; including trans-boundary ones and mechanisms that help reduce risks. Rob Vos, Director of FAO’s Social Policies and Rural Institutions Division and one of the authors of the report, told IPS that the threats posed by biological invasions and outbreaks of existing trans-boundary pests highlight the importance of investing in agricultural research to rapidly respond to threats. “The nature of trans boundary pests requires management on an international scale with countries coordinating their efforts. FAW is a highly mobile pest. The threat it poses to maize production and food security in Africa is not confined to individual countries but affects the entire region,” Vos said.